Suvarnabhumi Airport. Why can't we have one just like this in Manila? As soon as the plane touched the ground Wednesday last week, I felt like I was coming home. 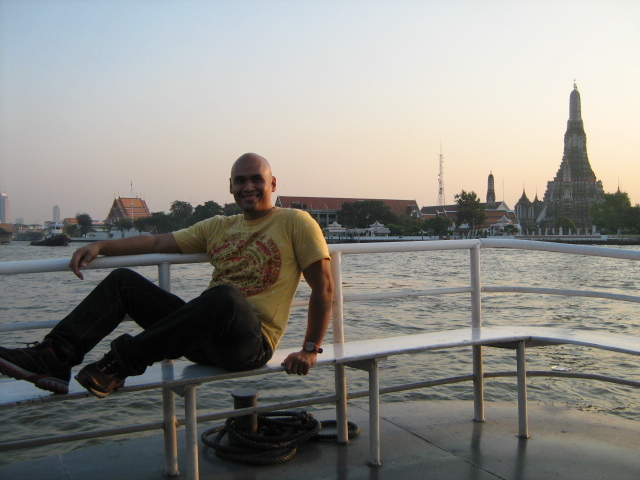 Since my first trip to Bangkok last 2007, I have always felt a connection to the city. No kidding. But news about Thailand always catch my attention. I held my breathe and prayed for peace when the yellow shirts blocked the airports. When Thaksin visited Cambodia and the Thai government protested, I too was bothered. Not because when the airport siege took place, I had a scheduled trip in December. And when Thailand threatened to seal off all borders with Cambodia, my worry was not just because I was going to head to Bangkok from Siem Reap in January. Maybe it’s the food, the temples, gay scene, the shopping, or even the foot traffic that makes the city so fascinating to me. There is a wonderful energy that seems to reverberate all throughout. 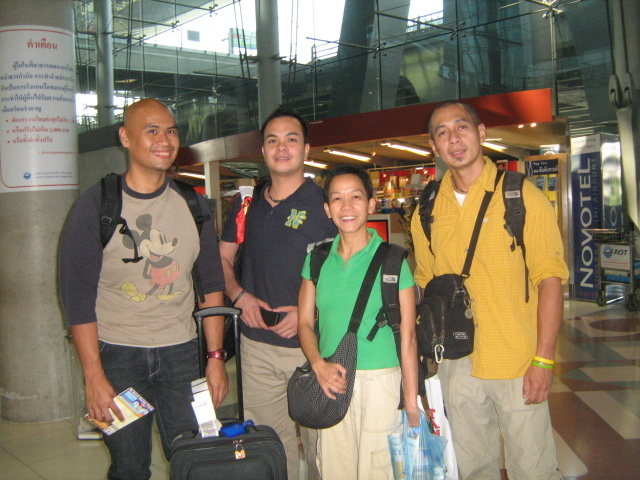 So arriving in Bangkok and with others with me, all first-timers, I knew it wasn’t going to be another trip. For one, I could act as de-facto tourist guide, a job that I would immensely enjoy. Plus, our PAL flight arrived just after lunch which meant not having to sleep-walk from the airport to the guesthouse at an ungodly hour—the trademark of every Cebu Pacific flight. We did fly econolight which meant being seated at the last row and no hot meals. But we didn’t mind. The flight was smooth and who needs a hot airline meal when you have a virtual buffet on good eats awaiting you when you land. The lines were really really long at immigrations and a group of Russian tourists ahead of us just kept crowding around each other. They finally got themselves into a proper line as one by one they went past the officers. Thankfully, Bam had some bread with her and a bottle of mineral water. I was really hungry by then. 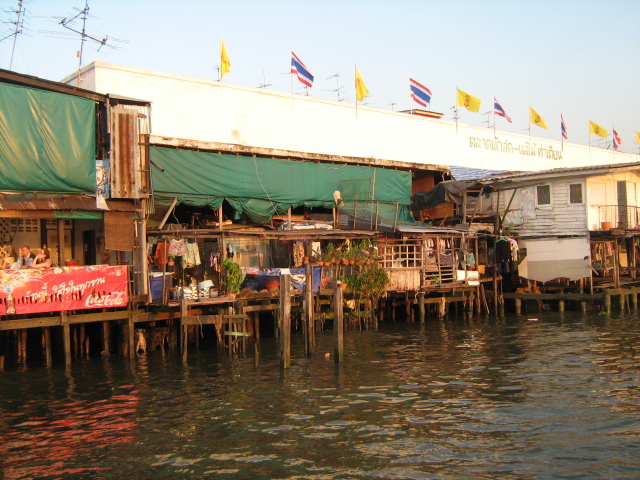 We headed to the Bangkok Christian Guesthouse Soi Sala Daeng 2, a great location that means easy access to all my favorite food stalls along Th Convent and and mere skip and a jump to Silom Soi 2 and the rest. The rooms were really clean and quite large with comfortable beds. were still there— the pork on rice stall manned by 2 gracious ladies near the 7-11, the crepe stall near the corner of Silom and Convent, the stalls that sell those tasty friend morcels (little fried things, I call them), the coconut stick and chocolate chip stick at Mr. Bun at the BTS Sala Daeng, the catfish salad at the MBK food court, and the pastry and cake stores at the Siam Paragon food court. A few changes also surprised me: the funky Food Fun at Siam Center has given way to something else, the BTS now goes all the way to Wongwiyan at the Thonburi side, and Robinsons Mall at Silom is now Fashion Outlet. The one thing that was really different with this trip is not going to DJ Station. I did have some Chang beer at Balcony with some people I made friends with at the Asia Fitness Convention (Flo and Victor of FIT and Meg, a group exercise instructor from KL). Babylon and Chakran still made it to my list, albeit short visits. I had fun re-visiting the Jim Thompson House Museum, the Grand Palace complex, and Ayuthayya with the others. What was particularly great about Ayuthayya was having someone take my pictures which meant really great photo opportunities, something I didn’t have when I went to Ayuthayya alone last year. Mostly everyone has flown back home already. I’ll be back in Manila around 6pm tomorrow and will be back to my regular life programming by Friday. Perhaps I should start taking steps to finding work in Bangkok and trying out my dream.